I have some Easter cards to share with you today. I made some of these a while back with my Mom when she was here visiting, but I am just now getting around to posting them. My Mom and I did some crafty shopping and I bought these cute little bunny dies from Impression Obsession. They are so fun! My first card uses them in a traditional way, as Easter bunnies in the grass with eggs scattered around. I colored in their ears and tails and added some clouds to the sky. The sentiment is from HA. My second card uses the bunny die in a funnier way! I cut the bunny out of some brown paper and made a chocolate bunny. Then I used a scallop circle punch to take a bite out of his ear!! Of course chocolate bunnies belong in an Easter basket, so I created one weaving pink and green strips together. I added a handle and some grass and tucked my nibbled on bunny inside. The white embossed sentiment is SU. My last Easter card was created with the PTI rustic wreath die. I cut multiple wreaths out of different pastel pattern papers and stacked them on top of each other. A few sequins scattered around and a pretty yellow bow finishes it off. This card was easy, but I really liked the way it turned out. Thanks for sticking in there through my lengthy post today! Do you have your Easter cards finished? Sunday was super fun over at the Hero Arts Flickr group! We held another scramble, number 105 to be exact. Don't know what a scramble is? Well, it is where card makers from all over the world get together at the same time to create a card or project with a certain theme - and the kicker is that you only have 90 minutes to do the whole thing - learn the theme, create your card, photograph it and post it on the Flickr site. Now you understand why they are called scrambles!! Well, I was definitely scrambling today! Janet was our hostess and she had a great theme to use sentiments create a 'word art' on our card. I wasn't even sure where to start?!? I thought of using a stencil and stamping words inside it, but that didn't seem quite right. I thought of using a speech bubble die cut and stamping HELLO repeatedly inside of it. This worked out okay, but then I didn't know how to finish the card. That idea led to me what I finally ended up doing. At one of our last crafty get togethers, my friend Kimberly shared some of these great big balloon die cuts! They are so fun! I stamped Happy Birthday in the middle of the balloon in black ink, and then filled around it with 'celebrate' in a rainbow of colors! It turned out better than I thought it would. I mounted it with foam tape on a fun patterned paper with tiny stars. The twine was curled to look like the balloon was floating! Thanks for hosting Janet and making me think!! It was really fun. Hero Arts scrambles are held every other week on the Flickr group. Join us next time! Today I am sharing a card I made for the challenge over at Live Love Cards, hosted by the ever talented Darlene DeVries. 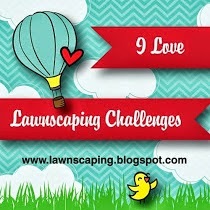 I have been following her blog for a long time, and she decided to start challenges!! What fun!! 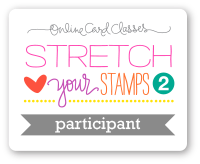 Her challenge this month is to used stencils on your card. She of course had an amazing example where she used a circle stencil and made them look 3D! I tried that same effect with a stencil that looked like a stone pattern, but my attempt was an epic fail!! But, I really wanted to play along in the challenge, so I came up with this card instead. It might be hard to tell, but the little stars were added with a stencil and a fingertip sponge dauber. I had this great patterned paper pad from My Minds Eye, called On the Bright Side. I used a sheet that had the banner across the top already. There were two sheets of each pattern, so I cut some of the banners off the second sheet and popped them up on the card. The happy was die cut with the Memory Box die and inlaid into the card. The birthday from Paper Smooches was white embossed on a scrap of the navy paper from the pack. After it was all completed I added the stars from the stencil in coordinating colors of ink. I used Memento Lady Bug and SU So Saffron. Even though the stencil was a last minute addition to this card, I hope it still qualifies for the challenge. If you haven't seen Darlene's work, you should really go check her out at her blog: Live Love Cards. She shares a ton of tips and tricks in her videos, you won't be disappointed!! Today I am sharing a card I made for the new challenge over at Ellen Hutson's The CLASSroom. Check out this great inspiration photo! I used the Folk Hearts die to cut a heart from some gold paper, and the Love You So stamp set to white emboss the sentiment. The background stripes were made with the PTI Cover Plate Diagonal Stripes. As this card uses some "never before used schtuff" (NBUS) - the heart dies and the stamp set are both new for me, I will also link it up to Darnell's challenge. My card today is all about spring!! We have had some great weather here in the Pacific Northwest and it feels like spring has already come. I have daffodils and tulips blooming in my yard and there are many trees blossoming with pink and white flowers! But I know not everyone has been so lucky - so this card is for those folks on the east coast who are still dealing with winter and wondering when it will ever be over! Hopefully my spring card will bring a little smile to your face and some sunshine to your part of the country! How is everyone's weekend going so far? Today I have a card to share that I made for the NEW challenges over at Ellen Hutson! They are have a mix it up challenge, where you combine stamps from the Essentials by Ellen line with stamps from Hero Arts. Two of my favorite companies - so this was a must for me! My card features the dandelion stamp from HA with the sentiment from Julie's new stamp set called Wish Big. Doesn't everyone make a wish when they blow the dandelion puffs? I used white pigment ink on dark navy paper cut with a stitched rectangle die. This was mounted on some PP with tiny stars. I am really happy with the way this turned out!! 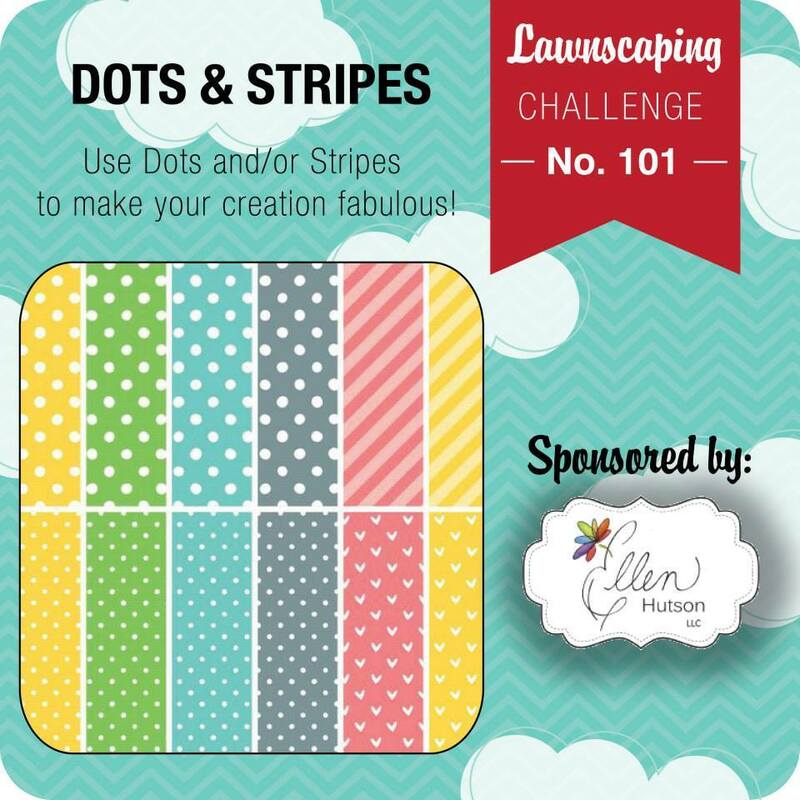 Just popping in with a quick post sharing a card I made for the Lawnscaping Challenge - Dots and Stripes. 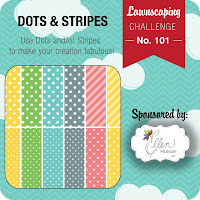 I used the super cute Happy Trails set and created a little scene with striped grass and a polka dot sky. I colored the car, camper and trees with my copic markers and added some clouds for fun. This was very fun to make, and really anything made with Lawn Fawn is so adorable!! I am going to give this to my DH for our anniversary which is next week. And seeing as we just bought a camper last year - I think it will be perfect!! 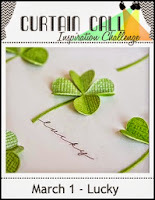 Today I am sharing a card I made for the Curtain Call Challenge. I started out with some SU certainly celery card stock, and inked up the little shamrock from an old SU set with some certainly celery ink and created a background. Then I made my focal point with a little heart punch and folded them to look like a four leaf clover. The sentiment is from the HA celebrate everyday set. A little polka dot frame finished it off! And speaking of St. Patrick's Day - my son's school just sent home the order form for spring pictures and it had a big note attached to it saying "Please don't wear green because of the digital backdrops" I didn't think anything about it until I looked at what day was picture day! You guessed it - March 17th, St. Patrick's Day! Who scheduled that!?! 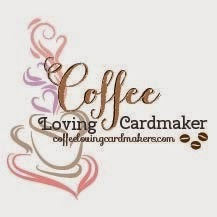 I'm back again today with another card for the Coffee Lover's Spring Blog Hop! I am lucky enough to get together with some crafty friends on a regular basis, and the last time we were together, the talented Kimberly Weiner had a make and take for us to do. I didn't actually complete the card she had made for us (too busy chatting), but I did manage to use some of the supplies to make this CAS card. She had the fun Paper Smooches coffee mug die and the stitched rectangles. I combined them with the 'steam' from a Fiskars set and a Paper Smooches sentiment. Hasn't this coffee hop been so much fun?? Have you linked up a coffee card yet? It can also be tea or cocoa if you aren't a coffee person. There are lots of prizes to be won, and a ton of inspiration to be had! 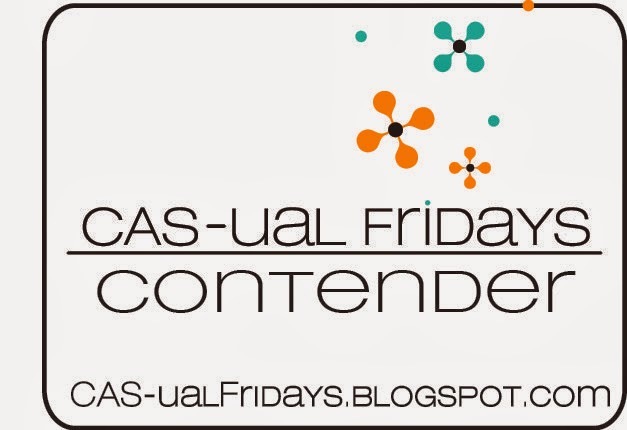 You have until Friday March 6th to link up and be eligible to win. What are you waiting for?? YEA!! My PTI order finally arrived! With their anniversary sale, PTI shipping times were a bit slower than normal, but I was very excited when the mailman left me a box of goodies on my doorstep last weekend! I pulled out the new Bitty Bouquets stamp set/die cuts and had some fun creating cute little spring flowers! I paired them with the Wet Paint 'thanks' which was embossed in white onto some vellum and adhered to a panel I dry embossed with large polka dots. 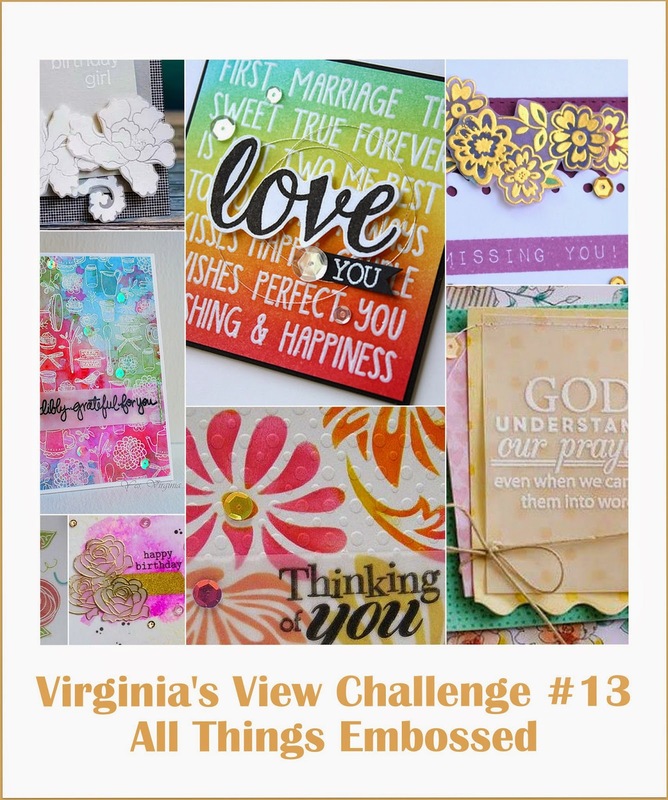 With all this embossing, I think this is the perfect card to enter into Virginia's View challenge. 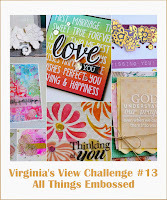 Did you know that she is celebrating her 1 year anniversary of Virginia's View Challenges? What an exciting milestone for her!! I'm not surprised that her challenge has been going strong for that long. I feel it is one of the best challenges out there! I love that she has guest designers to play along throughout the month, and I really appreciate the spotlight feature she does on the 25th. Its fantastic to acknowledge all the creativity out there! So here's to another great year Virginia! I know it is a lot of work to keep up with it all, so Thanks for all you do! !